(Bullets and Bracelets#1 (bts)) - The Female Furies were "pounded into shape" by their trainer Granny Harkness within the walls of the Granny Harkness Orphanage in the Armaghetto section of Thanoseid's Apokolips. (Bullets and Bracelets#1 (bts)) - The Female Fury known as Big Titania fell in love with the Apokoliptan Scott Free and, turning her back on Thanoseid and the Female Furies, joined his band of New Asgardian rebels. Big Titania and Scott Free were eventually married. Big Titania fought alongside the heroes of Earth and New Asgard during the SECRET CRISIS OF THE INFINITY HOUR in an attempt to defeat Thanoseid (who had gained access to the Infinity Links). But Scott Free sacrificed his life to foil Thanoseid's plans, causing Big Titania to become filled with hurt and rage. 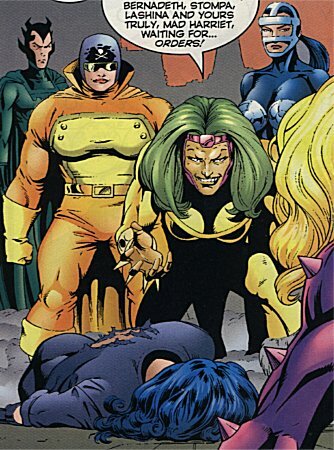 Big Titania re-afilliated herself with the Female Furies and eventually became their commander. (Bullets and Bracelets#1 (bts)) - When Granny Harkness learned that Diana Prince (Princess Diana of Themyscira) and the Punisher (Trevor Castle) (whose son Ryan had been kidnapped by Thanoseid) would be coming to Apokolips in search of their abducted son, she informed Big Titania and the other Female Furies of their impending arrival. (Bullets and Bracelets#1) - Big Titania confronted her former friend Diana Prince soon after she arrived on Apokolips in search of her baby son. Big Titania attacked her former ally, but her heart was not in the battle and she was soon defeated by Diana. As Diana asked the defeated Big Titania to reveal the location of her baby, the other Female Furies arrived on the scene and Mad Harriet struck Diana from behind, knocking her unconscious. Big Titania ordered the other Female Furies to deliver the unconscious Diana to Granny Harkness. Later, after Diana Prince had been brought before Thanoseid and Granny Harkness, Big Titania came to the realization that Diana Prince and the Punisher (rather than Granny Harkness and the Female Furies) were her true friends. As the Punisher arrived on the scene in an attempt to rescue Diana, Big Titania made sure that her former Female Fury teammates did not interfere on behalf of Thanoseid. As the Punisher battled the Female Fury known as Stompa, Big Titania incapacitated the Female Fury known as Bernadeth. In the end, the Female Furies were defeated and Thanoseid used his Omega Beams to send the heroes back to where they belonged. as their DC Universe counterparts? Mr. Ostrander: Big Titania was a real amalgam between Big Barda at DC and Titania at Marvel. Otherwise, the other Female Furies are essentially DC. 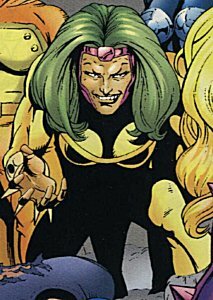 A member of the Female Furies, Bernadeth was present when the Females Furies attacked Diana Prince (Princess Diana of Themyscira) in BULLETS AND BRACELETS #1. She was then ordered by Big Titania to take the defeated Diana to Granny Harkness. Later, during the Punisher (Trevor Castle) and Big Titania's attempt to rescue Diana Prince from the clutches of Thanoseid and Granny Harkness, Bernadeth was attacked from behind and incapacitated by Big Titania. Bernadeth's weapon of choice is her fahren-knife, which she uses to burn her opponents from the inside out. Bernadeth is an Amalgam Universe version of Bernadeth of the DC Universe. 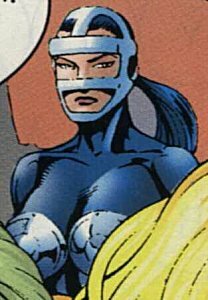 A member of the Female Furies, Lashina was present when the Females Furies attacked Diana Prince (Princess Diana of Themyscira) upon her arrival on Apokolips in BULLETS AND BRACELETS #1. She was then ordered by Big Titania to take the defeated Diana to Granny Harkness. Along with the other Female Furies, Lashina was later defeated during the Punisher (Trevor Castle) and Big Titania's attempt to rescue Diana Prince from the clutches of Thanoseid and Granny Harkness. Lashina uses flexible bands of steel called "lashes" to capture and injure her opponents. Lashina is an Amalgam Universe version of Lashina of the DC Universe. A member of the Female Furies, Mad Harriet knocked Diana Prince (Princess Diana of Themyscira) unconscious by blind-siding her with a spiked knuckle-guard after Diana had defeated Big Titania in BULLETS AND BRACELETS#1. Afterwards, Mad Harriet mocked her "vaunted commander" Big Titania for losing to Diana Prince. She was then ordered by Big Titania to take the defeated Diana to Granny Harkness. Along with the other Female Furies, Mad Harriet was later defeated during the Punisher (Trevor Castle) and Big Titania's attempt to rescue Diana Prince from the clutches of Thanoseid and Granny Harkness. Armed with spiked knuckle-guards, Mad Harriet seemed to harbor deep resentment toward her former commander Big Titania -- and that's even before Big Titania betrayed Thanoseid and the Female Furies. Mad Harriet is an Amalgam Universe version of Mad Harriet of the DC Universe. 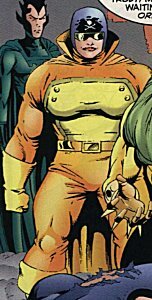 A member of the Female Furies, Stompa was present when the Females Furies attacked Diana Prince (Princess Diana of Themyscira) upon her arrival on Apokolips in BULLETS AND BRACELETS#1. She was then ordered by Big Titania to take the defeated Diana to Granny Harkness. Later, during the Punisher (Trevor Castle) and Big Titania's attempt to rescue Diana Prince from the clutches of Thanoseid and Granny Harkness, Stompa engaged and was defeated by the Punisher. Stompa is an Amalgam Universe version of Stompa of the DC Universe.